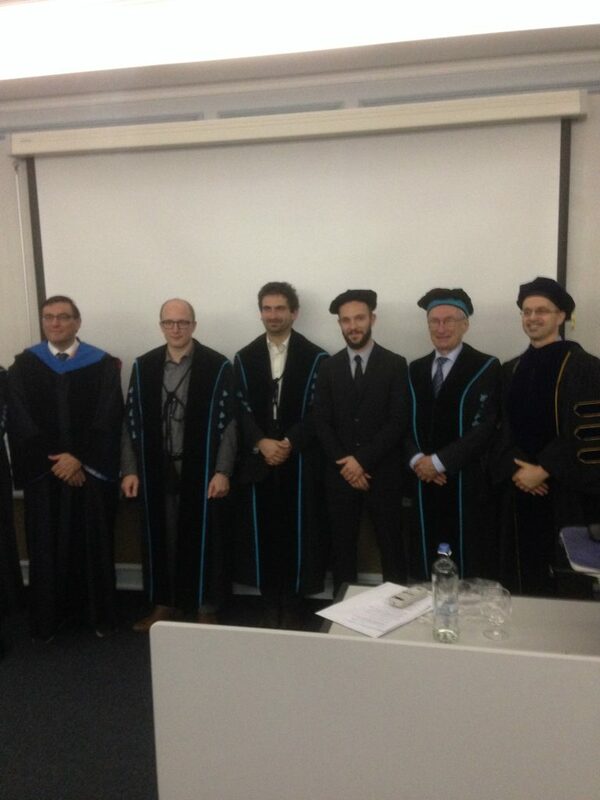 On Friday November 25, Silvio Matassa succesfully defended his doctoral dissertation at Ghent Universtity. The title of his doctoral dissertation was "Exploring protein production by hydrogen-oxidizing microbiomes". After being awarded a Marie Skłodowska-Curie PhD fellowship, Silvio started his PhD research at Avecom NV in Ghent in january 2014. A close scientific collaboration with the Center of Microbial Ecology and Technology of Ghent University was maintained throughout the whole PhD. His research focused on the microbiological aspects as well as the biotechnological potentialities of bioreactor-based microbial protein production using hydrogen-oxidizing microbiomes. On the picture Silvio (third from the right) flanked by his promotors Prof. dr. ir. Nico Boon and Prof. em. dr. ir. Willy Verstraete, both from the Faculty of Bioscience Engineering at Ghent University.